A vacation package to the U.S. Virgin Islands of St. Thomas and St. John offers that postcard-perfect appeal that travelers expect from a tropical island getaway. Boasting white-sand beaches, the crystal-blue waters of the Greater Antilles, and lush rainforests that house many exotic species, 'America’s Paradise' truly lives up to its name. 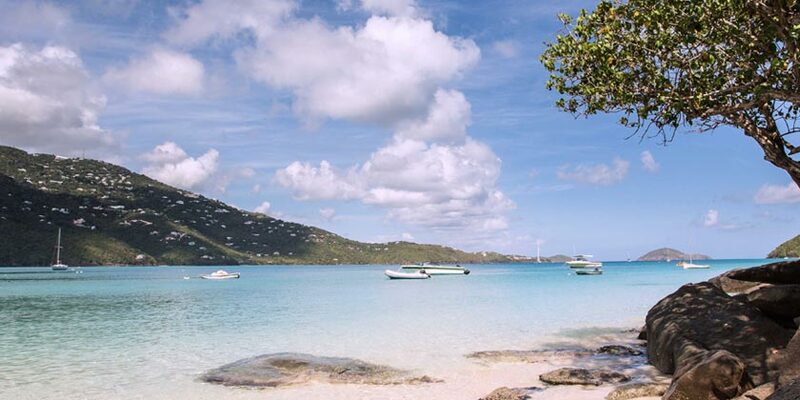 Stake a claim to one of St. John’s immaculate beaches or spend an afternoon fishing in St. Thomas’ Magens Bay. If water activities are your style, you’ll be happy to know that the U.S. Virgin Islands are one of the best places in the world for sailing and scuba diving. Whether you spend hours basking in the sun or a full day on the open sea, you’ll definitely have something to write home about. Book your St. Thomas flight today with United Airlines®. Ideal for families and active travelers hoping to experience the best of the islands, this tour is comprehensive look at the natural beauty and adventures of St. John. Resort info: This casual, beachfront resort offers a gracious blend of Caribbean hospitality and personalized service. Resort info: This luxurious getaway combines the elegance of the Caribbean with world-renowned service for a truly indulgent vacation experience. Resort info: The perfect choice for tropical relaxation, this resort offers spacious guestrooms featuring a balcony and great views overlooking the beach. Resort info: Overlooking the picturesque Charlotte Amalie Harbor, this hotel offers accommodations just 1 block from shopping, restaurants & inter-island ferries. Resort info: Facing a stunning white-sand beach on Nazareth Bay, this all-suite resort provides an appealing escape from the worries of everyday. Resort info: This classic retreat provides traditional accommodations and amenities perfect for the budget-conscious traveler.